WASHINGTON, July 28 /PRNewswire-USNewswire/ -- The U.S. Consumer Product Safety Commission, in cooperation with the firm named below, today announced a voluntary recall of the following consumer product. Consumers should stop using recalled products immediately unless otherwise instructed. Hazard: The spout's plunger cap can dislodge which can open the seal of the fuel container and allow gasoline vapors to escape. 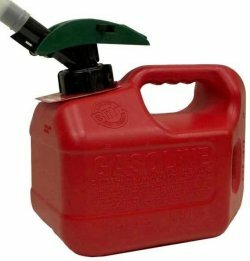 This could cause liquid gasoline to spill from the top of the container during use and result in a fire hazard. Consumer Contact: For additional information, contact Blitz Inc. at (888) 540-5177 between 8 a.m. and 5 p.m. CT Monday through Friday, or visit the firm's Web site at www.blitzusa.com.